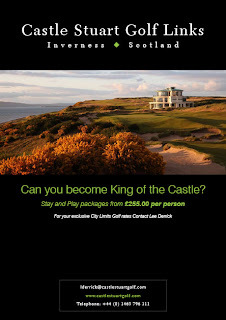 Plan B were delighted by by a request from our friends up at Castle Stuart to turn around a quick wee PDF design job for them last week and even more so when we got an email in from marketing boss Fraser Cromarty telling us that Castle Stuart Golf Links is now officially rated as the 56th best Golf Course in the World! The official rankings by the US based GOLF MAGAZINE were released this week on the 'front9' app with Castle Stuart being the highest-ranking debut on the World list. Following on from its success as host venue to the recently played Barclays Scottish Open, Castle Stuart's reputation continues to spread worldwide. 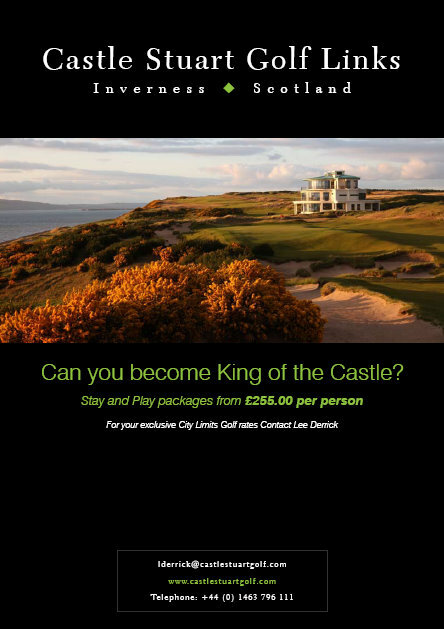 This recent award confirms that Castle Stuart is now one of the very best in the World. Also ranked in the Top 100 is Royal Dornoch Golf Course where it again features in the top 20 with a world ranking of 16th place. The Highlands of Scotland continues to grow its reputation as a must visit golfing destination and with two of the world's top 100 courses in close proximity to each other there has never been a better time to take the trip North. We continue to enjoy working with some great golf partners up that way too. Last year we redesigned the website for The Royal Golf Hotel in Dornoch, worked with Brora, Golspie, Tain and Dornoch in creating the Dornoch Firth Golf Pass and have more recently launched a complete redesign for The Clubhouse in Nairn. Add to that ongoing work for some great businesses such as Inveran Guest House in Nairn, and the pro shop at Royal Dornoch itself amongst a host of others and the idae of having a Highland office isn't so daft!